I've been getting a lot of questions about where and how to order Solotica lenses lately from Soompi, Youtube, and my blog, so I thought I'd make a post about it. First of all, these lenses are Brazilian which means you will ONLY find them online from sites like Viallure or lentesdecontato.net. These websites are in Portugese so it may be helpful to use some translator. There are a few things to keep in mind. First, the price of the lenses on the websites is in BRL (Brazilian reales) so you will need to convert the money into USD (American dollars) or whatever money you are using to pay. So don't freak out and think each lens is $150 USD! The lenses usually run around $40-50 USD depending on what style you buy, and shipping is around $20 USD. Shipping cost of course varies between sites so make sure you double check on all costs. These lenses are semi-opaque, which means that they are not completely a solid color but have little dots that blend with your natural eye color. The model for the color chart has light brown, honey-colored eyes and as you can see, each color blends in with his real eye color. This is a VERY IMPORTANT thing to know, because the color of the lens will be different on different eyes. For instance, on my medium reddish-brown eyes, the NC ocres (orangey yellow lens) looked honey-grey while the Hidrocharme mels (yellow lens) look foresty green. 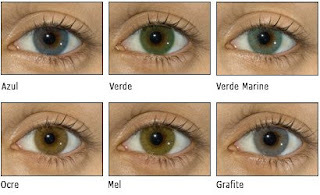 Mels actually mean "honey" in portugese and look lime green or yellow on light eyes! My advice would be to do your homework on these lenses. Look at photos of the lens on someone with your similar eye color. From what I know, natural colors can sometimes be too translucent for very dark eyes so they don't show up as well as charmes or cors. 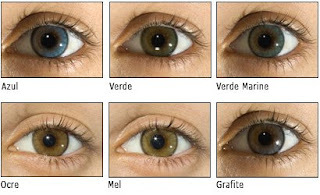 Charmes can give you an "innocent" look by enlarging your iris, while cors are the most natural. You just have to worry about "bleeding" with cors in certain colors (mel, ocre) because it may look like you have a yellow ring around your iris if your iris is small, which isn't the prettiest thing. Grafite (grey, but actually looks dark blue) and branca/ice (white, but looks light blue) don't give you a bleeding problem because their base color is white and blends in with your sclera. The limbal ring in natural colors and charmes masks the bleeding problem. Also, verde marine is more of a bright greenish aqua than in the color chart. Viallure now has an English-version of their website. Just click on the little British flag at the top right of the page. On the order page, the price is for 1 lens, and you need 2 so double the cost for the price of the lenses. Your order will show up on the next page with 1 lens for the right eye, and 1 lens for the left eye. Finish ordering through the website or e-mail or IM Ana Paula (English-speaking rep for Viallure) at viallure@hotmail.com if you get confused and would like to order that way. Ana is very nice and Viallure has great service. Just as an additional note, they will ask you for an ID number, but just give them a random number that you write down for your records. I hope that helps everyone out and I hope you guys enjoy these beautiful lenses as much as I do! EDIT 5/9/09: Due to e-mails and comments from various companies promoting or "calling out" websites for being good to buy from or being scammers, I have disabled the comments for this post. If you do have questions, please comment on the most current blog post. I urge everyone to be very careful in purchasing Soloticas online. Use a lot of discretion and do your research. If something sounds too good to be true, it probably is. Thanks guys. omg that was the most helpful post ever! i've been cruisin through lensaholics but nothing cleared up my questions as well as you did right there! I think I'm going to save up from natural colors ocre :D or hydrocor grafite. thanks so much! thank you so much for this! it was very helpful! Which lenses are you wearing in that picture? And which ones would you say are your favorite? Thank you for posting this. It was so helpful. You have such beautiful round almond eyes. I'm so envious! I wanted to ask which pair of lenses would you recommend for those who want to achieve lighter brown eyes given that they already dark brown eyes? Hidrocharme Ocre or Natural Colors Ocre? Thanks alot for this tutroial. I was contemplating if I should pm you via soompi, but then I found you made a blog about it :). You said grafite looks slightly blue, but would it look grey on dark brown eyes? Also because Grafite you said has like a white base, there wouldn't be no bleeding at all? meanig I could order the cor without chances of bleeding? I just came across your blog via an aspirin-honey mask search, and I just have to drop some praises for you. No doubt, you're a very pretty girl, and I'm so happy that you're sharing your beauty secrets with us. The Solotica lenses are the most natural-looking I've ever come across. Whoo- gonna buy me a pair now. Thanks for the post! Pearl: I would definitely recommend the hidrocharme ocre, as the NC tends to be unpredictable with translucency. It is often too dark on very dark eyes. The charme will show up much better. Anonymous: I use Everyday Minerals foundation in Fairly Light Neutral in the Intensive formula. For summertime when I get tanner, I use Golden Medium. Hope that helps! I know this is random but I came upon this site because I'm trying to get colored contacts, and i wanted a natural green look. Usually when people wear them it's obvious they're fake, but these look really great. So Im torn between getting the Hidrocor or the hidrocharme. What do you think? I naturally have deep brown eyes. if you have smaller irises, go with the hidrocharme. If you have larger irises, go with the hidrocor. Thank you Jen for this informative site. Question: How long does a pair of Solotica lenses last? I am going to buy a pair, but it seems they can't be bought in bulk (year supply). Also, I currently wear freshlook, which fit my eyes well. These have a diameter of 14.5. The Solotica have a diameter of 14.2. Will this make a huge difference? I'm having so much difficulty ordering them!? and how do I know if the size is alright for my eyes, do I need a prescription, etc. You are such a great help, thank you miss. Sam: If you are unsure about your prescription or what lens size fits you, I'd recommend getting your eyes checked with an optometrist. If you already know your lens prescription, you can input it when you order. If you have 20/20 vision, you will want to order plano lenses [-0, -0]. Thank you for the post. Do you know how long shipping takes if I place an order through viallure? I really like the Hidrocor lenses by Solotica, particualrly the Ocre, but I have a couple of questions. I noticed that the diameter for these lenses is 14.2mm and the Base Curve is 8.7. My eye diameter is 13.8 with a Base Curve of 8.6. Do you know if this will be a problem? Will it hurt my eyes? Will the natural effects of the lenses be affected in some way? Thank you for this great and helpful post! oh! another question... how do you maintain them? do you have to buy a special solution for them through Viallur? Hi, Jen! My eyes are dark brown and I have pretty big irises, I think. 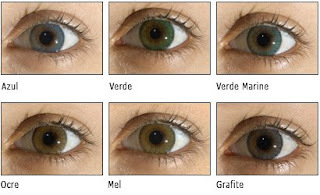 I just want my eyes to be a lighter tint of brown, so should I get the Ocres or the Mels. And I guess since my irises are bigger I should get the Hidrocors, right? You are such a help! Hi! I wear color contacts, but I wear Freshlook Pure Hazel. I was thinking of getting Hidrocharme Ice like you have now, but I don't know how to use it after you buy it. On the Villlar website it says they last for 1 year, but then how do you clean them? Can i just use the opti free lens solution and clean it nomrally? Or should i buy the ultra sonic thing you have; & how do you know when the contacts are used up when you use the ultra sonic cleaner? Thanks. I have lots and lots of more questions, so please email me at thinkpink127@gmail.com ! Thankss !! Hi jen you helped so many other people so I thought I would take a shot. I have really dark brown eyes. I'm looking for a solotica color that will make my eyes look light green or a vibrant green. Is that possible? I've heard that verde aqua looks really fake so I don't want to try that one. And I think that that mel might look more brownish honey like then green. this was very helpful =D im so glad i found this !! im saving it under my favorites for future reference..
hi jen, thanks for all your information!! your so helpful and pretty. ive been wanting to order the hidrocor in mel for some time. i think my iris is a normal size, and i want like a honey green color. do u recommend hidrocor or hidrocharme. and also ..do you know if they ship to canada. i live in toronto. I am interested in ordering solotica lenses and can't decide wether to choose the natural colors or hidrocor lenses. Are natural colors really transparent on dark asian eyes? I seen some pics on people with NC lenses and these lenses seem to pop out with color instead of the hidrocor. What would you reccommend if I want the color of lenses to really pop out NC MEL OR HIDROCOR MEL? I am just confused when you said it is transparent but I dont see that with peoples pics who have the NC LENSES on. The color pops out more then the hidrocor. I just order my Solotica Hidrocor-verde from lentesdecontato.net 3 days ago. They have a great sale now, 4 vials and a beach bag for $115 incluiding S&H. Their customer service is great, as soon as i pay for my order, they email me saying the green color was out of stock but they order from the distributor and would send it to me in 2 to 3 days. A dollar now in Brazil is $2 reals, so whatever you see the price in brazilian money, means you are paying half. E-mails me if you need more info, i can speak portuguese from Brazil. Jen, you are so helpful and nice. Your post gave me all the info I've spent the last hour on google looking for. Do you know if solotica lenses can be ordered in prescription to correct vision too? Thank you!!! <3 you are the best! Thank you for sharing all the information. I did a little bit of research and since I am Mexican it was really easy for me because portugues is almost the same as spanish. Just a hint for all of those buying the lenses, if you purchase them for cosmetic use, choose "Sem Grau (Plana)" which means without degree (plane)the total being shipped to US will be 171,00 around $ 72.46 USD for one pair. If you pay with credit card you might be paying to the Credit Card Company an "extra" hidden charge.According to the customer service operator form lentesdecontato.net the cores are the most popular and natural look, you can hardly tell they are contact lenses comparing with charms or natural color. Thank you again Jen, you are so pretty in all ways. God Bless you. I found this website a few months ago and ordered these lenses in hidrocor mel, and NO ONE CAN TELL!! I absolutely love them and will never never wear any other kind of contacts. ~Most people go for blue contacts when they really should go for green... look at your foundation... if it has a pink/rosy, blue or ashy undertone, go for blue or gray eyes. Anyone who wears warm beiges, yellowy, olive, and neutral colored foundation should go with green. And anyone who isn't a light blonde will look good in ocre! Thank you Jen! I ordered my solotica mel's from viallure.com and I just couldn't be happier with them! They are so comfy, I almost forgot I was wearing them and they look very natural. People, you need to try these contacts! So worth the money! The one thing that I think people need to know about viallure is the shipping. I paid for Fed Ex 2-7 day shipping (I live in Hawaii) and it took 2 weeks for them to arrive due 'clearance delay.' I finally emailed fed ex and they called me three days later asking me if they were prescription or not. These were not so they arrived two days later. I am not sure what kind of problems people can expect if they are ordering prescription lenses, but it seems to me that they were not going to ship them to me if I didn't have a viable prescription. So, be prepared to wait a lot longer for them to arrive and if you order prescription, better have your proof ready to get them cleared. I am having such a hard time ordering these lenses! I tried to use the lensaholics tutorial you linked to but I cannot join the board. Please help! Hi I wanted to know which is the best site to order from.. Im from Australia. hi jen, i'm a big fan of your website, it's awesome i visit it almost every day, you seem to know lot's of interesting things and you've been very helpful. I also have a question regarding the solotica lenses. I just order them a month a go and i love them, every since i saw them on you they look so natural. anyways my question is how much oxygen do they really allow in your eyes, are they healthy and safe as fresh look? Because i noticed that they are little thicker than any lense i wore and are they ok to wear them everyday? Please email me if you can at whitey_cute@hotmail.com or if can post a coment on your site that would be very helpfull, your propably the only one i can trust since you seem to know lot about them. Hello every body, I have bought Hidrocore Ocers from viallure, But i regret so badly Villure just steals money. They sell them more than twice as expensive as the lenses are! If you can use a translator or get some one who speaks Portuguese to help you, otica bellucci.com is the best and you can get them half price comparing to viallure and had shipping to all countries. Hi Jen...I want to buy a solotica lenses but i don't know where :(, I'm not sure viallure is safe because I know some people had problem with shipment and customs for Italy...do you know anything about?? Where you bought them? Sorry for any error...I'm not speak english...I've just tried :)...thank's!